Note: This is another story from the Unknown-author series. Why am I coming up with such stories? I'll tell the answer soon. You're not taking that old thing, are you?" Mom said when she saw me packing the yellow shirt. "I wore that when I was pregnant with your brother in 1954!" "It's just the thing to wear over my clothes during art class, Mom.Thanks!" I slipped it into my suitcase before she could object.The yellow shirt became a part of my college wardrobe. I loved it. After graduation, I wore the shirt the day I moved into my new apartment and on Saturday mornings when I cleaned. The next year, I married. When I became pregnant, I wore the yellow shirt during big-belly days. I missed Mom and the rest of my family,since we were in Colorado and they were in Illinois. But that shirt helped. I smiled, remembering that Mother had worn it when she was pregnant, 15 years earlier. That Christmas, mindful of the warm feelings the shirt had given me, I patched one elbow, wrapped it in holiday paper and sent it to Mom. 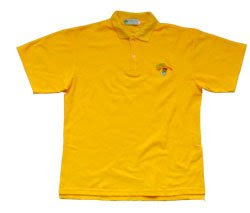 When Mom wrote to thank me for her "real" gifts, she said the yellow shirt was lovely. She never mentioned it again. The next year , my husband, daughter and I stopped at Mom and Dad's to pick up some furniture. Days later, when we uncrated the kitchen table,I noticed something yellow taped to its bottom. The shirt! And so the pattern was set.On our next visit home, I secretly placed the shirt under Mom and Dad'smattress. I don't know how long it took for her to find it, but almost two years passed before I discovered it under the base of our living-room floor lamp. The yellow shirt was just what I needed now while refinishing furniture. The walnut stains added character. In 1975 my husband and I divorced. With my three children, I prepared to move back to Illinois. As I packed, a deep depression overtook me. I wondered if I could make it on my own. I wondered if I would find a job.I paged through the Bible, looking for comfort. In Ephesians, I read,"So use every piece of God's armor to resist the enemy whenever he attacks, and when it is all over, you will be standing up." I tried to picture myself wearing God's armor, but all I saw was the stained yellow shirt. Slowly, it dawned on me. Wasn't my mother's love apiece of God's armor? My courage was renewed.Unpacking in our new home, I knew I had to get the shirt back to Mother.The next time I visited her, I tucked it in her bottom dresser drawer.Meanwhile, I found a good job at a radio station. A year later I discovered the yellow shirt hidden in a rag bag in my cleaning closet.Something new had been added. Embroidered in bright green across the breast pocket were the works "I BELONG TO PAT." Not to be outdone, I got out my own embroidery materials and added an apostrophe and seven moreletters. Now the shirt proudly proclaimed, "I BELONG TO PAT'S MOTHER. "But I didn't stop there. I zigzagged all the frayed seams, then had a friend mail the shirt in a fancy box to Mom from Arlington, VA. We enclosed an official-looking letter from "The Institute for the Destitute," announcing that she was the recipient of an award for good deeds. I would have given anything to see Mom's face when she opened the box.But, of course, she never mentioned it. Two years later, in 1978, I remarried. The day of our wedding, Harold and I put our car in a friend's garage to avoid practical jokers. After the wedding, while my husband drove us to our honeymoon suite, I reached for a pillow in the car to rest my head. It felt lumpy. I unzipped the case and found,wrapped in wedding paper, the yellow shirt. Inside a pocket was a note:"Read John 14: 27-29. I love you both, Mother." The shirt was Mother's final gift. She had known for three months that she had terminal Lou Gehrig's disease. Mother died the following year atage 57. I was tempted to send the yellow shirt with her to her grave. But I'm glad I didn't, because it is a vivid reminder of the love-filled game she and I played for 16 years. Besides, my older daughter is in college now, majoring in art. And every art student needs a baggy yellow shirtwith big pockets. so sweet. straight out of heart and touched me. Good story .It is actually easy to write complex subjects and tough to write simple-feel good stuff . Keep it up , unkown author . Btw , i know that the Unknown author is you . but i agree, it's beautiful! Its really really nice...very touching!